*Here being Afghanistan. But that's what you get when you combine the Army's newest UAV helicopter, the A-160 Hummingbird, with a 1.8 Gigapixel ARGUS sensor, the Army's single most powerful camera package to date. 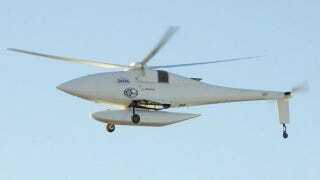 The A-160 Hummingbird is a long-loitering, remotely-operated surveillance platform. It has been under development by the Boeing corporation since 2004 but originated from a 30-month DARPA contract with Frontier Systems back in 1998. The 35-foot long aircraft weighs just 6500 pounds fully equipped. It has an estimated top speed of about 160MPH, a range of over 2500 nautical miles, a service ceiling of roughly 30,000 feet, and can operate for over 24 hours at a time with a 300-pound payload. That's incredible longevity usually reserved for platforms like the Army's Blue Devil blimp. Combine its high service ceiling with a very powerful camera, and Army Intel can track targets for miles without moving the drone. The ARGUS-IS (Autonomous Real-Time Ground Ubiquitous Surveillance Imaging System) sensor is the most potent in the Army's arsenal. Also originally from DARPA and now built by BAE systems, the ARGUS-IS collects six petabytes of video every day. That's 79.8 years of HD video every 24 hours. No wonder the ARGUS requires two processing subsystems, one aboard the aircraft and another on the ground, to parse the massive flow of data. The mission of the Autonomous Real-time Ground Ubiquitous Surveillance - Imaging System (ARGUS-IS) program is to provide military users a flexible and responsive capability to find, track and monitor events and activities of interest on a continuous basis in areas of interest. The overall objective is to increase situational awareness and understanding enabling an ability to find and fix critical events in a large area in enough time to influence events. ARGUS - IS provides military users an "eyes-on" persistent wide area surveillance capability to support tactical users in a dynamic battlespace or urban environment.